Do I have to sign a nutrition coaching contract? We do not require you to sign a contract because reaching your nutrition goals shouldn’t have a timeline. We will work with you for as long as you need our coaching services. Payment is required before services are rendered and all payments will be charged on a recurring basis. We highly recommend that our clients work with us for at least 3 months to give you the best opportunity to create sustainable new habits to improve your nutrition. How can I begin a coaching relationship? Schedule your initial session on our Schedule with Us page or contact us at gwen@beyondtheboxnurtition.com or sheena@beyondtheboxnutrition.com. What kind of foods will I be able to eat? Will my diet change drastically? We always recommend the foundation of one’s diet is based on wholesome and nutrient-dense foods (lean protein, carbohydrates, fruits, vegetables, and healthy fats). However we know that eating these foods 100% of the time is highly unlikely (and no fun). The wonderful thing about flexible dieting and counting macronutrients (macros) is you decide what food makes up your daily diet. Do I need to weigh, measure and record everything in my diet? We know this can be an overwhelming task at first but the more you practice, the better and easier it gets. Based on our experience, simply estimating portion sizes and calories is not effective. Human error often leads us to overestimate or underestimate how much we are eating. As your coaches, we will help educate you on how to weigh and measure your foods. Luckily for all of us, there are numerous apps and resources available at our fingertips to make this easier. For those who have no intention of weighing or measuring, we are open to discussing how we can best help set up a nutrition plan that fits your capabilities. We’re confident we can help anyone who wants help. How are you different from other Chicago nutrition coaches? While there are many nutrition coaching services available and you may be tempted to try counting macros on your own, we believe in the power of teamwork, accountability and working together to achieve your goals. We understand that each client is unique and strive to provide individualized services to each client. Your macronutrient plan will change over time based on your feedback, progress, lifestyle (i.e. travel, job changes, schedule changes, etc.). Together we discuss best practices for you to help ensure you have the best results. What are "macros" and why do I need to count them? Counting macros is a way of creating awareness and accountability towards your daily calorie needs. It helps you develop a sustainable way of eating that can complement your lifestyle and food preferences. Knowledge is power and accurate information is vital to your success. As coaches, we need to know what you are eating, how much you are eating and how you respond to those choices. The only way to make true change is to collect information, make an assessment and determine what action needs to take place to maximize your results. Only when we have control over variables can we realistically expect to have any influence over an outcome. We want your outcome to be as positive as possible. When can I expect to see my personalized nutrition plan produce results? Results aren’t always numbers on a scale. Results can be anything from improved body composition, fitness, recovery from workouts or training sessions, sleep, energy, mood, sexual health and/or mental clarity. Typically physiological changes will occur before any physical changes in your body. We’ll be consistently monitoring your progress and making sure we celebrate every “win” along the way. Enjoying the process typically leads to better adherence and a more enjoyable journey. 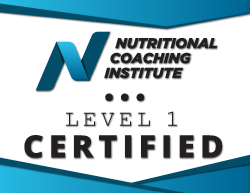 How do I know if nutrition coaching is right for me? Like anything in life, you won’t know until you try. There’s a reason you’re looking to make a change and we’d love to be the ones to help you get there. We understand change is hard but we’ve been in your shoes and we’ve made the same “leap” you are considering making. We offer a free consultation to every prospective client before they start working with us to ensure that we’re exactly what they’re looking for. Click here to get started. We can help you create meal ideas based on the macronutrient plan we provide for you but we do not offer templated meal plans and we never will. We want you to experience the freedom, accountability, responsibility and control that comes with being able to make your own food choices. We’re thinking outside the box, remember?